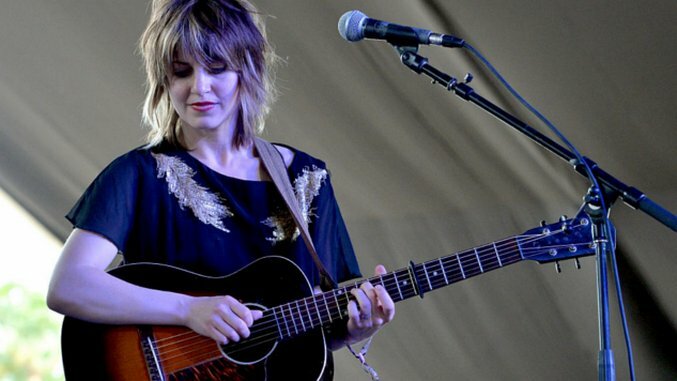 Anaïs Mitchell has been called “the queen of modern folk music.” Her poetic lyrics have been likened to those of Bob Dylan and Leonard Cohen. She wrote an off-Broadway musical about which Lin-Manuel Miranda recently raved. And yet, despite such accolades, she has never quite gotten the attention her music deserves. Earnest, observant, and philosophical, Mitchell brings poignancy to the ordinary and meaning to adversity. Looking back at her extraordinary, if too often overlooked career, here are 14 of the best songs by Anaïs Mitchell (excluding collaborative projects such as Hadestown). Fading love and autumnal decay—it’s a hackneyed pairing, but Mitchell makes it feel fresh. She jaunts through a progression of exclusively minor chords (rare in folk music) to tell of an ended romance from a detached, seemingly wizened perspective. “Come September” is an older song that Mitchell rerecorded for her latest album xoa. A delicate duet of banjo and guitar evokes the southern countryside of an American legend in which a white settler falls in love with the daughter of Shenandoah, an Algonquian chief. Mitchell has a knack for beautiful melodies, one that she has refined by opting for simplicity over the sometimes-overdone vocal maneuverings of her early career. The gentle “Shenandoah” moves through one of the loveliest tunes she has ever written, made even more so by the harmonies in the “oh”s of the chorus. The archetypal free-spirited woman has been a muse since the dawn of fiction, but rarely is her story rendered as moving as it is here. This track, in contrast to Mitchell’s catalog of detailed narratives, is unadorned and straightforward. “I never felt so high / I think I’m comin’ down,” Mitchell murmurs over a sparse piano accompaniment. Her voice is wistful and vulnerable as it descends in imitation of “coming down.” It is impossible to say what the purest expression of sadness sounds like, but this must come close to it. This song takes place in the aftermath of a falling out and deals with lingering guilt. Mitchell’s use of horns and a chorus of singers in Young Man in America’s arrangement connoted religious absolution; xoa’s stripped down version has the more nuanced tone of an internal dialogue. She is self-reproachful, haunted by her perceived mistakes and imperfections, from “every lump inside your throat” to “anything you tried to do.” Yet she finds the empathy to forgive both herself and her former companion. In a recent interview Mitchell described her commitment to making songs “useful for people” as opposed to writing purely for “getting something off my chest.” She achieves that in this song. The track’s repeated line is simply “you are forgiven”: this is mercy that requires no elaboration or justification. It is sympathy founded in basic and crucial human compassion towards others and oneself. For listeners who need permission to free themselves of guilt, Mitchell leads by example. Few inspirational songs are as honest and effective. Here is yet another track that Mitchell improved on xoa. In the song’s extended metaphor, both she and her actions are mechanized and she copes with a breakup “semi-automatically.” It begins with a barely-audible sigh and floats through slow guitar picking and heavily reverbed vocals that gradually vanish into a sonic night sky. “Do you copy?” Mitchell asks. One can imagine this message traveling through space and time. In a chills-inducing blend of the history and modern politics of the West Bank, Mitchell contrasts hope with devastation in side-by-side portrayals of the birth of Jesus Christ and of a Palestinian refugee. The transition between the two accounts is seamless: the same words that Mitchell sings to describe opulence suddenly convey privation and peril. Addressing these loaded topics in tandem is ambitious, but Mitchell makes the task feel natural. This is not a song to put on repeat; it is a track from which one recovers and on which one ruminates. Even when writing about somber circumstances, Mitchell (almost) never leaves listeners without a glimmer of positivity, often in the form of wisdom learned. In “Changer” she optimistically asserts that the imprints of love last beyond love’s conclusion. She fluctuates between this bittersweet mindset and a more devastated sense of loss; her dual-mindedness feels realistic to the aftermath of a separation. It is a testament to Mitchell’s lyrical prowess that her words are explicit enough to be meaningful and rich with images, yet ambiguous enough for a range of listeners to identify with them. This is the sort of song of which a person’s interpretation can shift over time, growing and maturing as listeners go through changes of their own. The opening track off Mitchell’s second major release, The Brightness, is fittingly bright. She begins by imploring an evasive lover to “come outside” so that she can see “your dark eyes shining darkly.” Notably absent is any of the anxiety or dissatisfaction one expects to accompany romantic uncertainty. Although she wonders, in clever word play, both “wither” and “whether” this person’s “fonder heart lies,” her affection has no contingencies, and she is at peace with any future outcome. “If I cannot take you for a liar or a lover / I’ll take you for my brother in arms,” she sings. This song counts among her most heartfelt vocal performances, and her earnestness is matched by the powerfully rising saxophone, guitars, and strings that soar into a wall of sound in the refrain. Though “Tailor” is not one of Mitchell’s many overtly political songs, it spins a feminist message. It is the tale of a woman who remakes herself in the image of what a man wants, as women are often conditioned to do. “When he said that he liked the clothes I wore / I became a tailor,” and “When he said that my body he’d not miss / I became a sculptress.” Even more elementally, this song addresses a human problem—Mitchell takes on one of the most basic existential questions, fretted over by everyone from Ramana Maharshi to Hamlet: “Who am I, who am I?” Who are we before conditioning? Is there such a thing as an authentic self? Are we autonomous? Mitchell pulls herself out of this philosophical abyss and identifies some original, independent activity. “Didn’t I split my mother’s side?,” she asks. “No one taught me how to cry / How to cry for what I wanted in the night,” she states, which, movingly, evokes both the image of a baby crying at bedtime and an adult woman weeping for the lover whose intimacy she yearns for by night. Add a sentimental accordion solo, and the human condition was never represented so heartbreakingly. This is the Odyssey for 21st century America as told by Mitchell, in which she and a backup band trade a lyre for drums, horns, reeds, a mandolin, organ, and electric guitars. It mythologizes the figure of the modern man, following him from the moment of birth until death, when he becomes “another wayward son / waiting on oblivion.” Mitchell’s dramatic language transforms ordinary events into an epic. As a perfect counterpart to “Tailor,” the song has broad resonance (especially due to her use of familiar folk imagery), but specifically digs into plights associated with masculinity: Mitchell gives her hero a restless spirit, aggression, and a thirst for power. The instruments, which together create a powerful, syncopated beat, act as a narrative driving force. They proclaim the young man’s entrance and propel him towards his finish. Mitchell captures enduring love and may restore your faith in humanity in this depiction of an affectionate long-time couple enjoying an evening out together. One lover serenades the other, clear-eyed about the troubles of the past and inevitable trials to come, yet confident in the lasting power of their bond. Mitchell illustrates not only durability but also the beauty in change, as the narrator is moved to see that his or her lover looks “like a stranger in that old-fashioned hat.” A beautiful melody, simple chords, and a pure message combine to give this song a feeling of timelessness. Just as the characters are moved by “our song” on the jukebox, “Old-Fashioned Hat” could easily be an anthem for modern romantics. “Every day the muezzin calls, sun comes up, and Baghdad falls.” The line hits you harder than bricks, in the way only a piercing lyric can. Mitchell’s track imagining an Egyptian woman’s response to a war-torn Middle East is pertinent today, though she wrote it as a student in Cairo over a decade ago. She again combines politics, history, and legend, this time in an intergenerational dialogue between females in an Arab family who figuratively merge with the figures of Umm Kulthum, an Egyptian singer in the mid-20th century, and Scheherazade, the famous storyteller of One Thousand and One Nights. In the album notes for Hymns for the Exiled, Mitchell describes storytelling as a, “power that even the powerless retain.” In this song she focuses on its history specifically among women. King Shahryar, for example, subjugated and murdered young women until Scheherazade conquered him with her words. As an ingenious female storyteller herself, Mitchell fits into the very tradition about which she sings. This track opens her label-debut album and so foreshadows a career of powerful song-stories to come. This song’s introspective lyrics—which are deeply personal, yet touch on universal sympathies—along with its unique structure make “Now You Know” Mitchell’s best. “Now You Know” witnesses a human thought unfold, branch, and return to its origin. Mitchell’s sharp narrative impulse is at its most moving as she portrays the progression of an emotional reaction. Listeners don’t learn the reaction’s context until the end, when Mitchell reveals that she was singing an explanation to her lover of why she’d been crying. The guitar part is characteristically simple and lovely, barely dressed up by light hammering and slides. This is unveiled sentiment and Mitchell at her most vulnerable. She captures the nature of association. She analyzes emotion while also illustrating its ultimate inexplicability.